HindeSight Letters / India / We have done it: Indian Investment Letter Launched! We have done it: Indian Investment Letter Launched! It’s been hard work but today we’re launching our Indian Investment Letter to our database of well over 3,000 investors keen to understand how they can make the most of one of the best emerging economies on the planet. We have taken time to release our quarterly Investment Newsletter #1 but now it’s out there it’s getting some serious attention. We’re not the only ones that think India is worth a look at for Investing. As the Indian Times reported earlier this year – Warren Buffet is up for purchasing an Indian Company if ‘It’s big enough’ Or what about The Financial Express who suggested with the Prime Minister Modi taking the country from 2tn to 20tn, now’s the time to invest. Even over here in the UK Merryn Somerset Webb of the FT and Money Week has suggested India looks to have a ticket to superior returns. We’re not jumping on the bandwagon as we had said for a while that we would be delivering an Indian Investment Letter this year as we have an in-house team at Hinde Capital (the sister company to Hinde Publishing that releases the investment letters) who have been modelling our amazing stock screener technology that we use for superior returns in our Dividend Letter for the Indian market and it’s performing better than we expected. 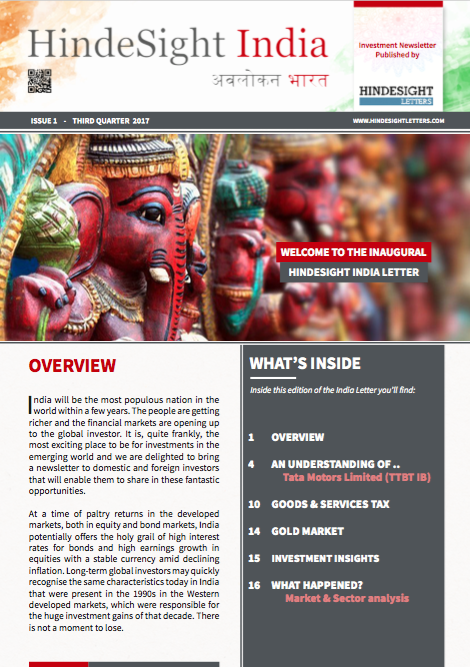 So here it is, our first ever Indian Investment Letter – the FREE educational 26 page research letter that’ll help you to understand the financial markets in India and make the most of what we see as one of the most exciting markets on the planet.